It sounds kind if risky, I mean, won’t I end up with a thick growth of dark stubble? Nope, that’s a big fat myth. I get it though, you’re likely a worried woman weighing up the pros and cons of shaving your facial hair, because you’ve heard all sorts of horrifying myths. Though the practice of women shaving their faces as we know it today has been around for decades (at least privately, if not publicly) – it’s still a somewhat taboo subject. Are you in the closet about your face shaving ways? It’s understandable that with unsightly facial hair comes great embarrassment and shame for women. Of course, most women would prefer not to have any visible facial hair at all, but genetically, we’ve all got some to deal with. And any woman with peach fuzz would certainly prefer that no one else know about it, or that they’re having to regular shave it. The increase in information, and the expansion in women’s rights and expression have made this a topic that has gradually become easier to talk about – and admit. 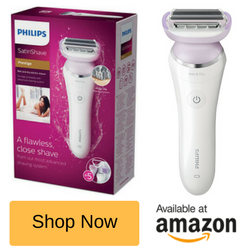 In fact, there are now small electric shavers like the Philips HP6392/00 Precision Body Hair Trimmer (and other shaving tools) designed specifically for removing face fuzz and touching up on small areas on the body. It’s a compact enough gadget to fit in a makeup bag and resembles a mascara pen with the cap on. While woman shaving their face is a relatively recent development in the United States, women in the UK and other parts of the world have been shaving their faces for a very long time. For example, Japanese women, in part, credit their smooth, beautiful skin to shaving their facial hair – a statement which may hold some merit. The practice is becoming more commonplace in the western world as certain myths that were long-tied to woman’s shaving have been debunked, some of which I’ll get into. If you’re new to this face shaving game, you’ll need to know which tools are best and how to use them. Forget hair removal creams, waxing, or tweezers – sure, they’re effective, but painful and time consuming. If you’re going to shave your face hair off, you’ve got 2 choices – an electric shaver or manual razor. Now, you don’t want to use a large lady shaver, because they’re designed primarily for shaving legs and arms. Trying to navigate a bulky woman’s electric shaver around your face will be awkward, and you might lose half an eyebrow if your vision is obscured by the machine. 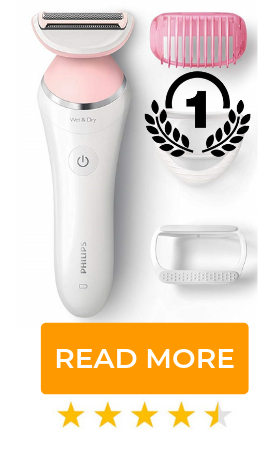 You’d be better off with a small ladies’ trimmer, like the Philips Precision Body that I mentioned. That’ll let you accurately trim your chin, cheeks, upper lip, jawline, forehead, around ears, or wherever on your face you might be sprouting hairs that need removed. The main benefits of going with an electric trimmer is that it’s super convenient. You can trim your hairs quickly wherever you might be – at work, a night out, or holiday. There’s less chance of cuts, and ingrown hairs. And because you’re dry shaving, there’s no messy foams and water required. If you want to try manual shaving – no, it’s not reserved for men – you’ll need some shaving foam / gel and an appropriate razor. 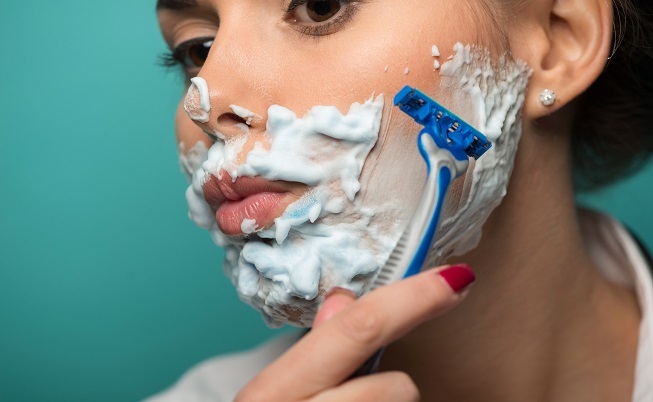 Don’t use one of those 5 bladed men’s razors, as they’re made to cut through dense stubble – you’re only shaving some light female fuzz, not heavy gorilla growth. A 1 – 3 blade lady razor or safety razor would be ideal, like a BIC Miss Soleil or Gillette Simply Venus. Something sharp, light, and small that’s easy to use. Manual razors give a closer shave than electric as the blade is in direct content with the skin and not shielded behind foils. With this mild scraping comes the benefit of dermaplaning, which is a type of deep exfoliating process. As the blades drag across the skin, hairs are cut, and dead skin cells and other oily unwanted surface debris are removed, leaving your skin very smooth and soft. This also leaves your skin open and more able to absorb nourishing post shave moisturizers and skin creams. 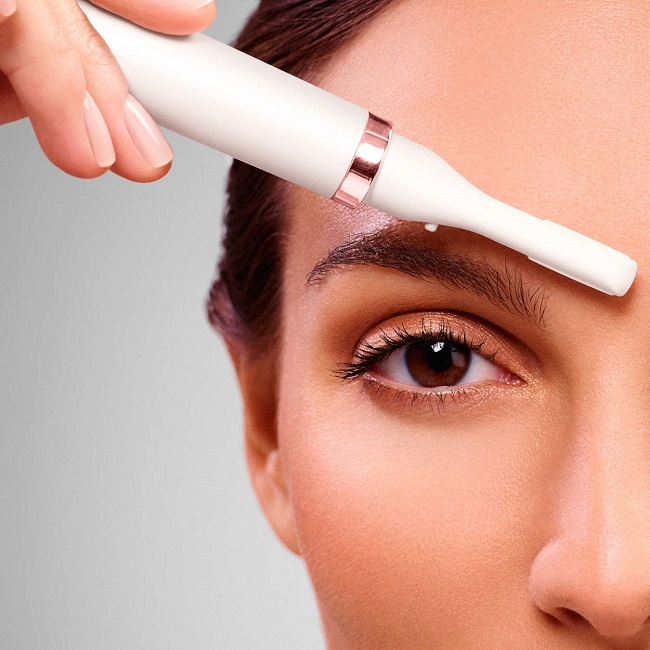 Dermaplaning is said to reduce fine lines and wrinkles, and signs of aging. I’m not sure I’d go that far, but it’s sure healthy for your skin and makes for a great base to apply makeup. The practice of shaving your face has many similarities with shaving your legs. There are a few key differences that you will want to take into account to optimize your results. Start by thoroughly cleaning your face and removing all make-up. Wet your face and apply a woman’s shaving cream or gel to the area you will be shaving. Shave in the direction of your hair growth and not against the grain as you would with your legs – more on this later. Avoid pressing the razor too hard against your face, light strokes will suffice. Once you have finished shaving, wash your face with a mild cleansing soap. Rinse your razor and place it in a dry place. When moisturizing post shave, you will want to use a quality moisturizer to sooth the skin, reducing any irritation or inflammation that can be caused by shaving. Remember, your skin has been exfoliated from the shave, and will absorb creams more easily. Therefor – get something with no artificial perfume and fortified in vitamins E, B5, aloe Vera, and other skin enriching ingredients. If you’re heading outdoors after you shave, you’ll want to be sure to use a product with sunscreen. 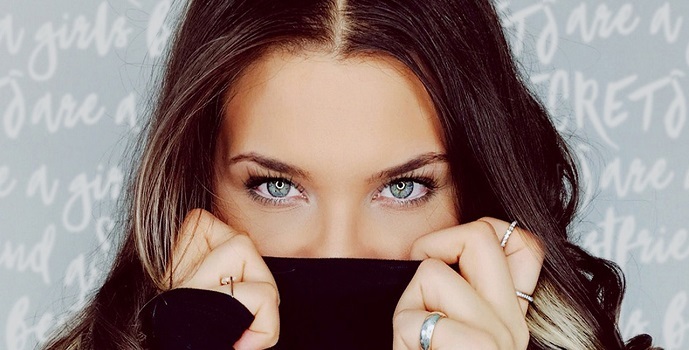 Facial products that contain anti-aging retinols are best used at night. If you choose the electric option, all that’s required is to switch the device on and start trimming – simple as! Shaving Myth: You should go against the grain, like you do when you shave your legs. The opposite is true here; you want to shave your facial hair in the same direction as it grows in. Shaving against the grain is a great way to get a close shave, but you’re also more likely to get razor bumps and ingrown hairs. Think about the way you’ve seen men shaving their face, it’s the same process. Shaving Myth: You need a special razor that is made just for the face. There are specialized razors that are made strictly for use on the face, as I’ve pointed out. While these facial razors might be nice to have, the truth is any sharp single-blade razor will be effective. 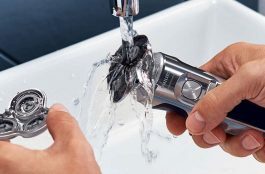 Those 5 blade razors and powerful electric shavers are overkill, anything that cuts clean will work. Shaving Myth: Anyone can shave their face and get great results. There are certain circumstances that don’t work well for shaving. For instance, if you’re on prescription medication for acne, you should not shave. These types of medications could cause an increase in skin sensitivity. If you have any active skin condition, such as acne, wounds or psoriasis, you will want to wait until the condition is fully healed before shaving. It’s important to note that if your facial hair is particularly thick or coarse around the jawline, it’s a good idea to get examined by a doctor prior to shaving it. This type of hair growth may be indicative of an underlying hormonal issue. Shaving Myth: Your hair will grow back thicker once you start shaving. This is probably the most common one I hear, and to be honest, I fell for it, too. If there is any one myth that strikes fear into the heart of women and prevents them from shaving, this would be it. While it’s true that shaving will temporarily result in stubble as the hair is growing back in, it will never cause your hair to grow back in thicker, or darker, for that matter. We are born with a certain number of hair follicles. Unless we destroy them with laser hair removal, our follicles will always grow our hairs back in at the same thickness and at the same rate of growth. The only reason the hairs feel thicker when they grow back, and the skin has a rough texture is because the hairs have a sharper edge from being cut. When hairs fall out and grow back in naturally, they have a finer, softer point. In order to avoid stubble, you will have to keep up with your maintenance and shave on a weekly basis. Shaving for women is a good way to remove facial hair and could improve skin health. If you’ve used powdered makeups you’ll notice that the grains can cling to the hairs, leaving a messy barrier over the skin. Clean shave skin absorbs hydrating, nutritious moisturizers and makes for a better base for makeup. Give it a try and see how it works for you. It’s not guaranteed to work for everyone, I don’t know how your skin will react, but it’s a facial hair removal method worth trying.